← Slash and Burn – Some Things Can’t Be Recyled! Here are 5 winter fresh greens to grow so easily you’ll be amazed and wonder why you haven’t done it sooner. You can buy special sprouting seed trays, which stack and drain very easily, but why not re-cycle a jam or coffee jar and some old tights? That’s all you need to grow these nutritious fresh greens. Add to salads, sprinkle into stir-fires or use as a vitamin packed garnish costing a fraction of those at the supermarket and once you’ve bought a pack of seeds you don’t have to go shopping (carbon and money-saving even more). They’re also organically grown if you think about it. Water and no additives! 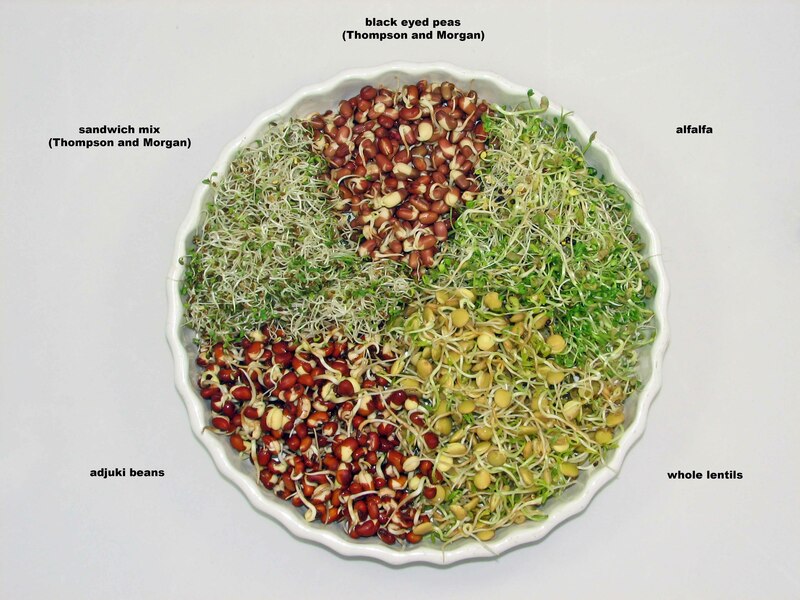 All sprouted seeds have a higher concentration of vitamins and minerals than their fully grown counterparts, as the nutrition in concentrated in them so they can grow. The content of each varies, but they’re all great for you and at this stage sweeter, tastier and more crunchy. To see more detail, click into the picture. I grew all of these in less than a week from opening the packet of seeds to putting them on the plate. All you do is place a tablespoon or so of seeds into a large jar or layer of a seed sprouter, covering the end of the jar with a bit of old tights or stocking. Secure this with an elastic band. Rinse them with room temperature water, drain and leave on the windowsill ( but not in bright sunlight). Do this twice a day until the sprouts have reached the size you want to eat. Some have rough seed coats that you might not want to chew, but if you put the grown sprouts into a bowl of water and stir, most of the husks will float and you can scoop them off and put them in the compost bin. Nothing wasted, ecologically! Some sprouts, such as mung beans, used in stir fries, are better grown in the dark to make the sprouts grow longer and juicier before they go tough and bitter. Just pop them in a kitchen cupboard between waterings. And beware! Not all seeds can be sprouted. Many of the bean family are poisonous raw, so don’t try to sprout runner, French, kidney or other true beans. Check a seed catalogue for the most appropriate ones. Thompson and Morgan and Kings Seeds do good ranges. You don’t have to pay through the nose, though, for tiny packets from specialist seed growers. I buy standard packets of mung beans and whole lentils from the supermarket and they sprout perfectly well. Children would find these sprouts very rewarding as they grow so fast, teaching them how things grow and maybe getting them to eat their greens into the bargain. We started with five and ended with nine. There are many more for you to discover. Bonus! Let me know what you grow on your windowsill. Any recipe ideas? This entry was posted in ecoclogy, lifestyle and tagged ecology, food, growing, lifestyle, organics, re-cycling. Bookmark the permalink. I haven’t, but I will. Thanks for that Squirrel Basket! I love beetroot.